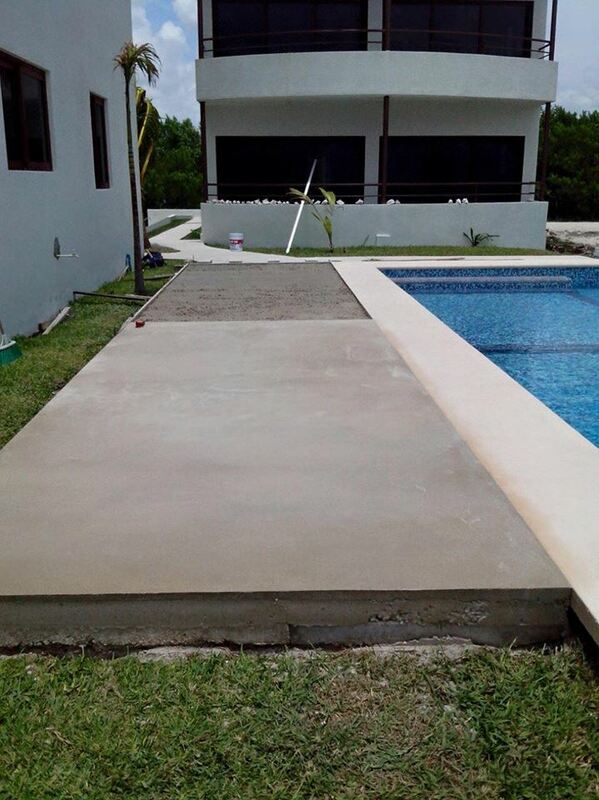 There is a brand new condo project just about to be completed here in Mahahual, Caban Condos. Caban Condos are being developed by Regal Properties. 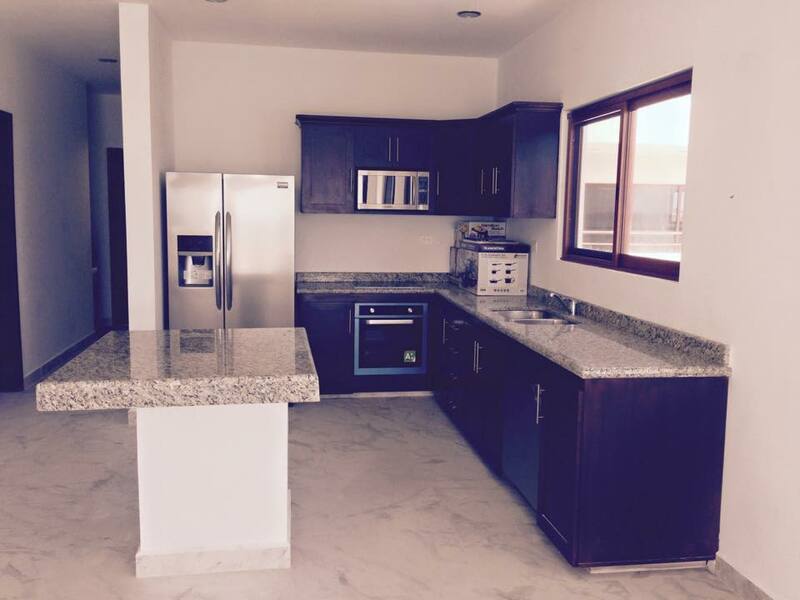 These brand new condos are located in the Benque Soya part of Mahahual. 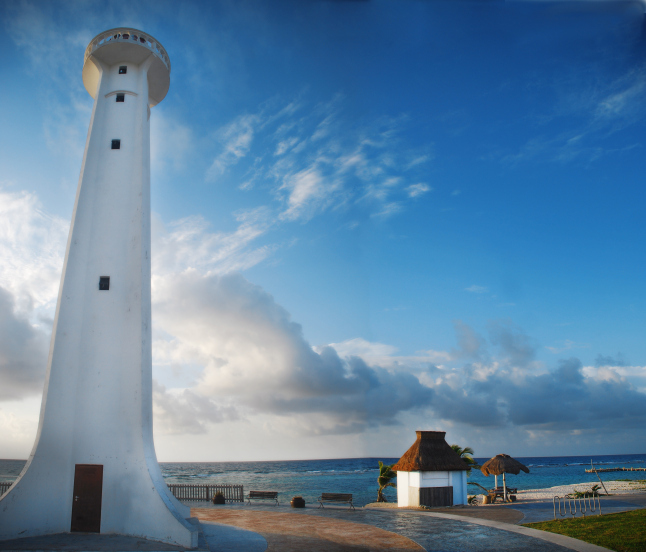 Benque Soya consists of the property and land from the lighthouse on the malecon down to almost the port. I never venture much down on that side of the malecon, so I had no idea of the new luxurious condos being built there. Last week I went down to talk to the developers and look around, and they gave me a nice tour. Mike Delaire, the owner and developer, and Parrish Kondra, sales manager of Caban Condos, gave me a nice and thorough tour, and I was impressed. 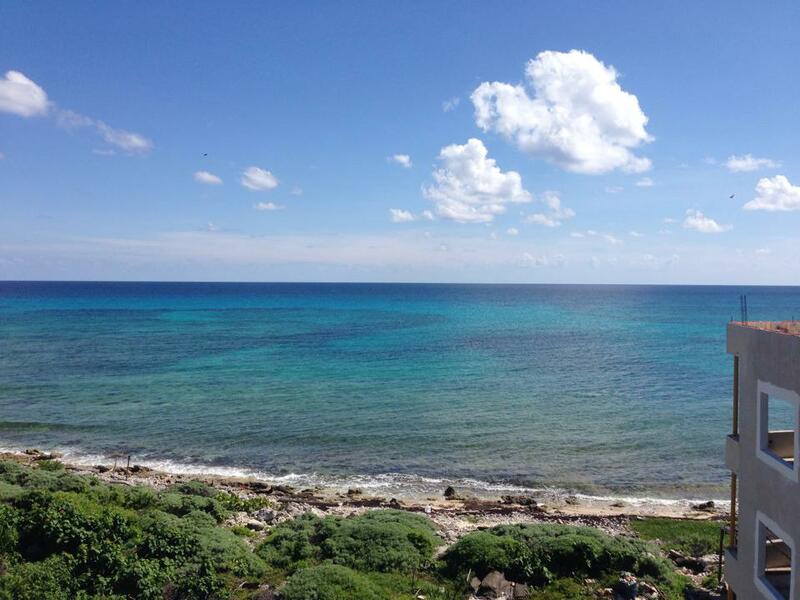 The condos are located on a nice piece of land right on the water, with a beautiful view of the Costa Maya Port to the left, and the town of Mahahual to the right. There is also a spectacular view of the Caribbean Sea from there. View from terrace roof of condos. The condos are located about 200 yards down the dirt road right in front of the lighthouse, very private and exclusive. 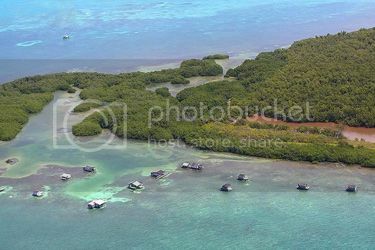 The condos are set between the beach and the mangroves, and you are surrounded by nature. 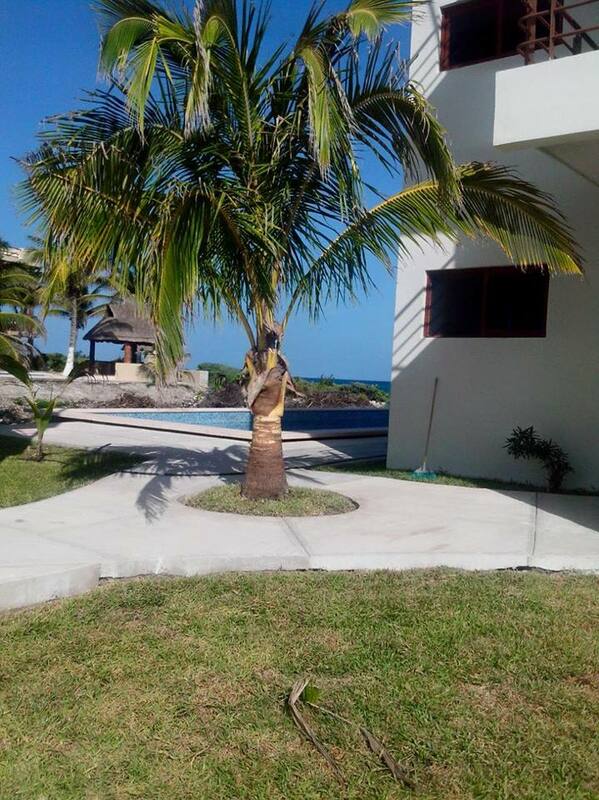 The condos are also just a short walk from the malecon, and also a short distance from New Mahahual, (Casitas as some of the locals call it), so the condos are very centrally located. View of Mahahual from Caban Condos. The condos are built to local regulations and specifications, and meet all the criteria set to protect the mangroves and environment here. The condos are all modern and have all the up to date amenities. I was impressed with the layout of the condos, and I especially liked the kitchen and all of the appliances. These condos also come ready to move in, from pots and pans, barbecue grill, washer and dryer, and just about everything else you need to move in. Nice kitchen with all appliances. Living area with great view. The condos all are 2 bedroom units with a den, and are 1538 sq. ft. They all have granite counter tops, solid wood cabinets and doors, traveltine flooring, air conditioning, 6 appliances,(including a dishwasher), and all fixtures. There is also a furniture package available if you wish. The Caban Condos are constructed to be hurricane resistant with concrete block walls and white stucco and slate tile finishing. 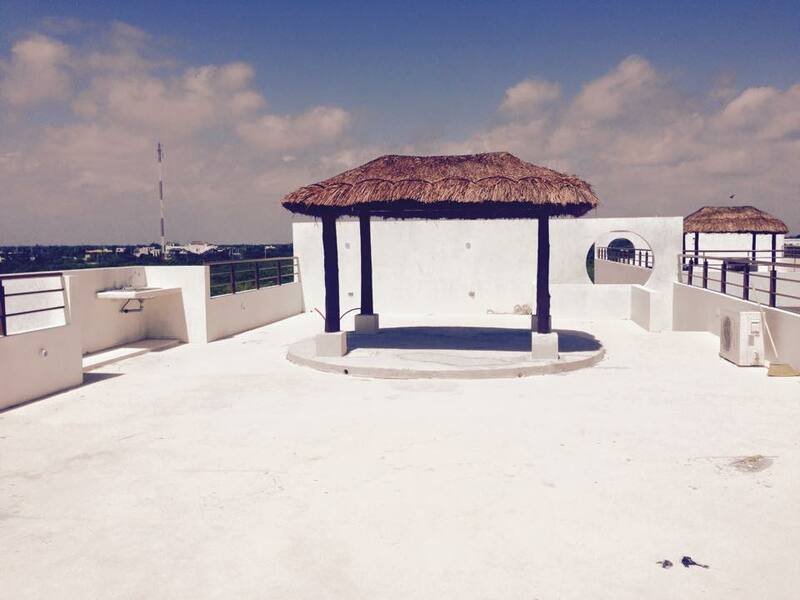 There is a roof top terrace with an outdoor cooking area with a great view. 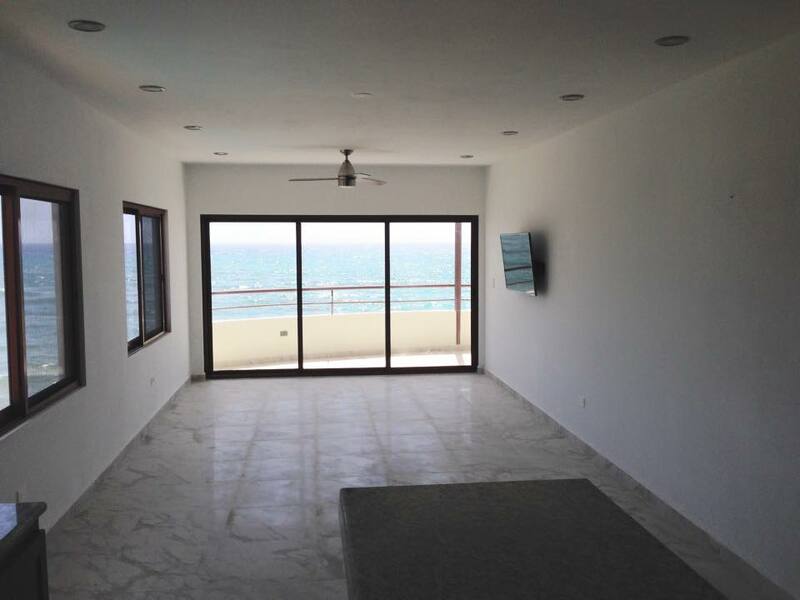 All units also have an open air balcony to enjoy the cool Caribbean breezes, and sunrises and sunsets. 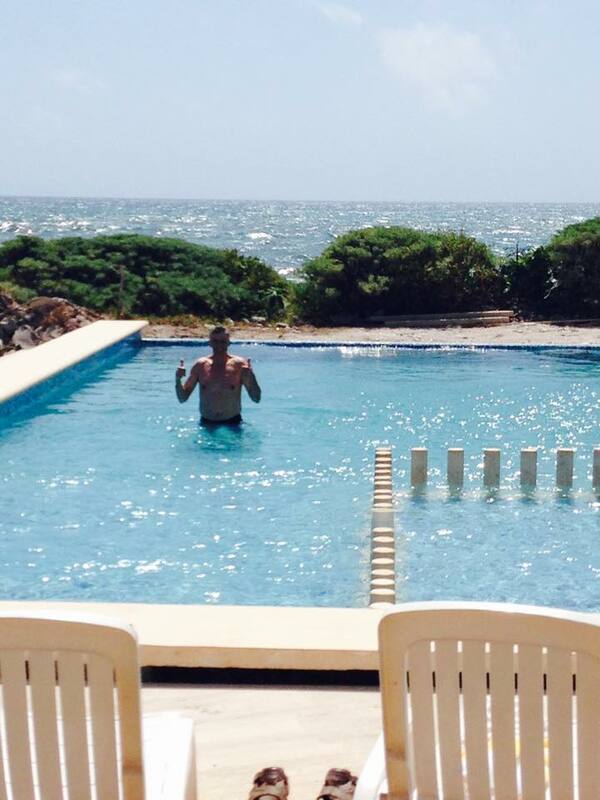 They also have the first fresh water infinity pool I have seen in Mahahual, and it is nice. There is also going to be a pool side bar and 24 hour security. Rex Farley, one of my blog readers in the pool, lucky guy. 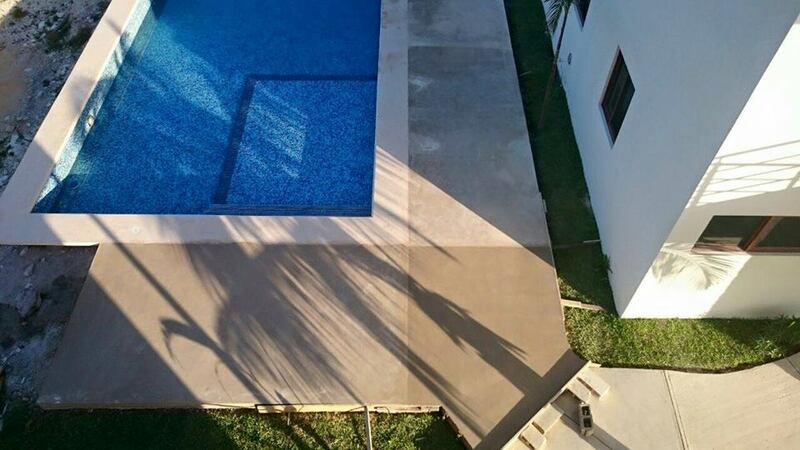 The condos start at $199,000 USD, and there is also going to be a second phase of construction. The penthouses have already been pre-sold in this phase of construction. There is also a optional rental program available, if you want to rent your condo when you are not there to make some extra income. 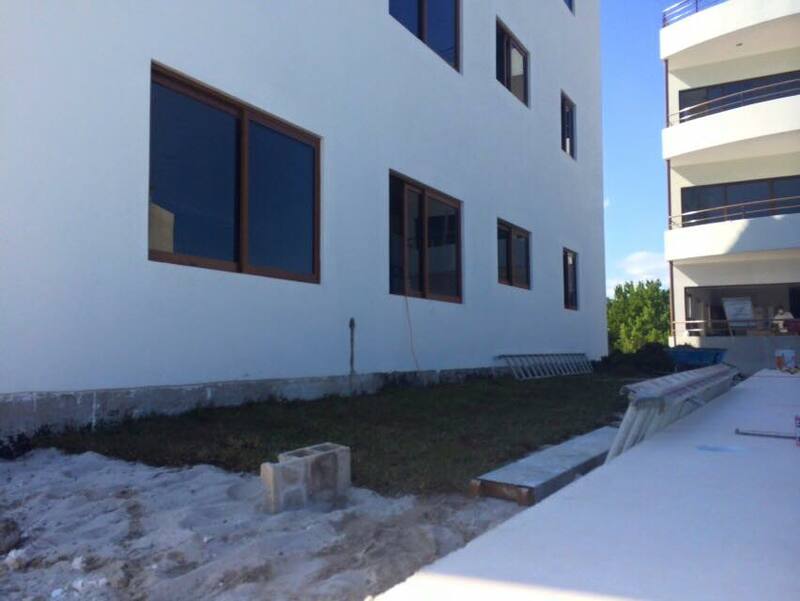 There is going to be a big need in the near future here for nice condos to rent in Mahahual during the high season. 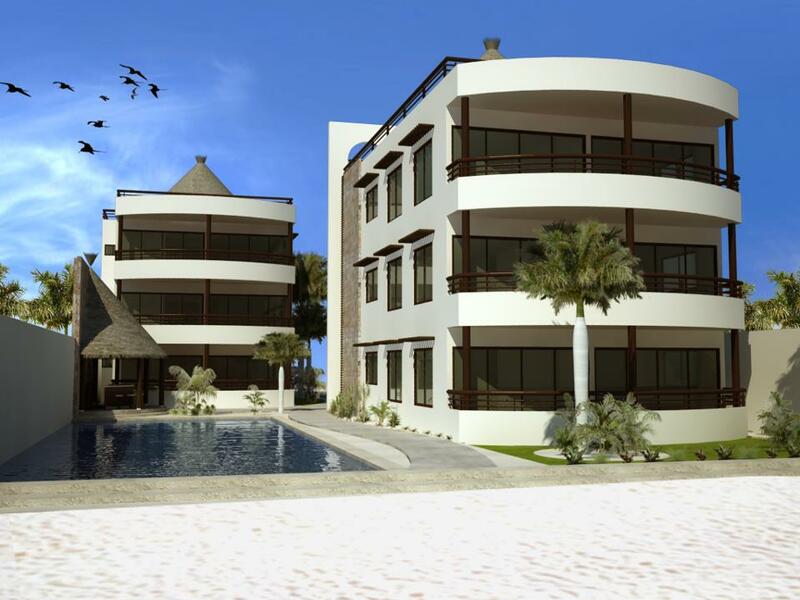 Regal Development also has a condo project going on at the moment in Merida, and plans to be involved more here in Mahahual, with future projects. Both Parrish Kondra and Mike Delaire are from Canada, and have started their real estate development company here in Mexico , so they are registered and comply with all the rules and regulations here in Mexico. In fact, Parrish plans to move here full time in the near future. I will write more on Regal Development and their company in the near future. 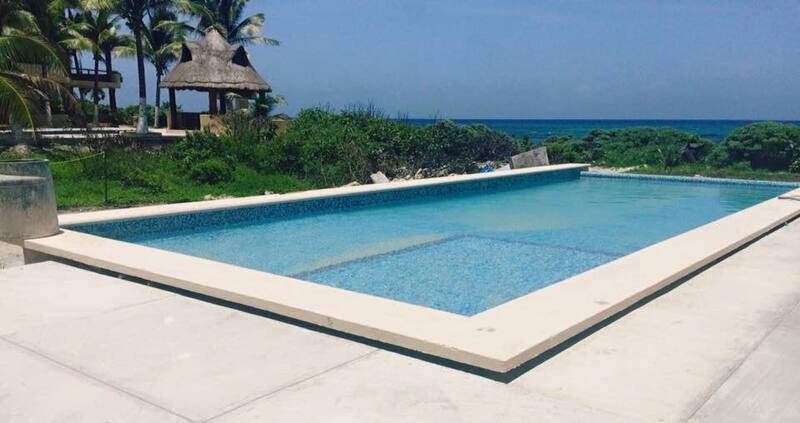 So if you are looking for a very nice condo with all the modern amenities, and a spectacular view of the Caribbean Sea here in Mahahual, check out Caban Condos website at http://www.regalproperty.net/caban-condos/, or go to their Facebook page, https://www.facebook.com/CabanCondos. Here is a video of Caban Condos, to give you a better idea of the project. All construction should be complete sometime in September I was told, so they are almost ready to move in. If you are looking for something off the malecon in Mahahual, but still want to be on the water, you might want to look at these. They are far enough away from town to be away from all the hustle and bustle, and the noise, but still just a short walk or bike ride away. I really liked the layout of the condos also, and I love the balcony doors and the great view. I just hope I get invited to swim in the infinity pool one day. Today I am finishing the post I started yesterday comparing crime and safety between Belize, (where I used to live) to Mahahual, Mexico, ( where I live now). I used the U.S. Department of State website to get information and statistics concerning crime in Belize, and also Mexico. Yesterday I shared this information concerning Belize, and today I will include what the website says about Mexico. I will also share my personal insights and experiences like I did yesterday. This is my sixth part on my ongoing series comparing living in Belize to where I now live, Mahahual, Mexico. So far I have compared cost of living, medical and health care, food and drink, and the fact English is spoken in both places. Today I will concentrate on crime and safety in both countries. I have already written several articles in the past concerning how safe Mexico is compared to the portrait painted by the USA media. Today I am going to include facts from the United States Department of State website. I will also give some examples of what I have experienced first hand. 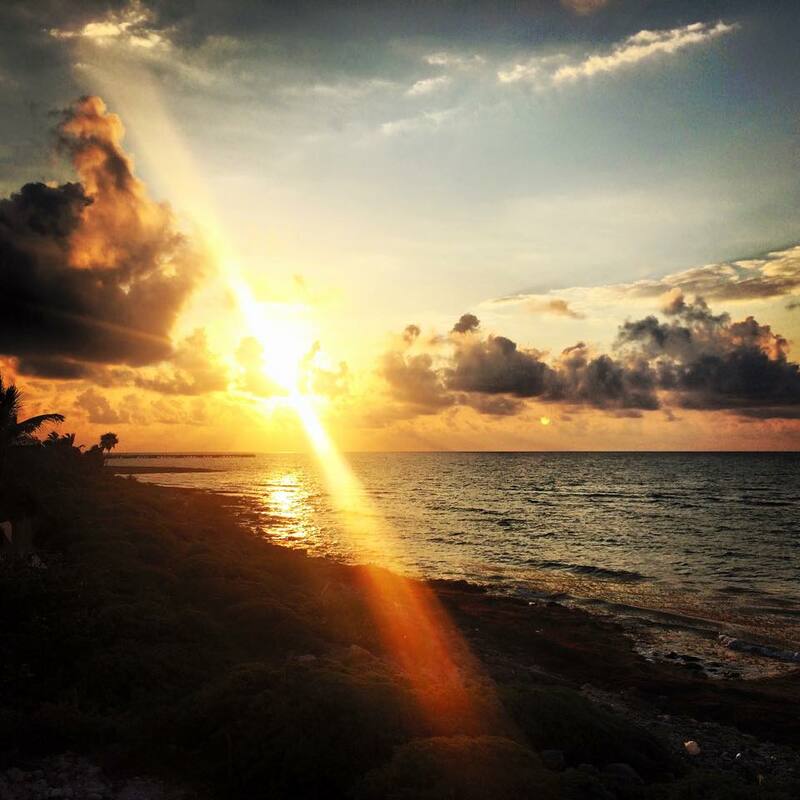 This is a great video about Mahahual and the beaches. It also goes into the problem of plastic and other trash washing up on the beaches. It gives an in-depth explanation of the reef and ecosystem here also. This post I am doing today is the Mexican side of medical and health care compared to Belize medical and health care. There is a lot of interest in medical and health for retirees trying to select a place to retire or live on the Caribbean and the tropics. Yesterday I wrote about Belize and the lack of good quality medical and health care there. As you will read in this post Mexico has the best health care in this area, and perhaps the best in Latin America. CostaMed clinic, near port in Mahahual. I have been writing a series of articles lately comparing living in Belize compared to living in Mahahual, Mexico. Belize is touted on the internet and in magazines as the perfect place to live or retire for ExPats from USA, Canada, and Europe. Today I am going to compare medical and health care in Belize and Mexico. I wrote a post last week about all of the people from the USA that are now enrolled in Mexico’s universal health coverage, and it was the most read post or article I have ever written on this blog. The difference in health care between Belize and Mexico is staggering. Mexico out distances Belize in every aspect of medical and health care. It speaks for itself when expats leave Belize and come to Mexico to get quality health care. In this series of posts I am doing comparing living in Belize versus Mahahual, Mexico I have covered several aspects, today I am going to compare cost of living between the two. Like I have written before, I get a lot of questions from people at the port about living in Belize. When people find out I have lived before they always have a bunch of questions for me. I lived in Corozal and at Kich Pan Ha, (near Orange Walk) in Belize for over two years.